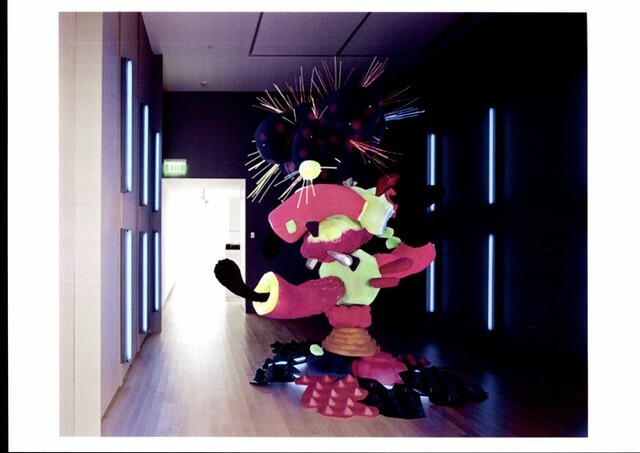 ‘Into My World’ was a key part of the exhibitions and installations that re-launched the Aldrich Museum after a renovation and expansion project that doubled the Museum’s existing size. The Museum has a reputation in America of encouraging and promoting new and emerging artists to a new audience. The participating artists were presented as bold contributors to the continuing definition of contemporary sculpture in the UK. The show set out to contrast the artists against the established YBA ‘Sensation’ generation through examining their concerns, methodologies and creative outputs. My own contribution to the show comprised an installation work using black light to activate fluorescent nylon flock covered sculptural shapes. The hypnotic affect made reference to psychedelia and pop mythology. The catalogue for ‘Into My World’ generated new essays by Aldrich curator Jessica Hough and Stephan Hepworth which critically re-examined the current development of British Sculpture and its forebears in the framework of an American perspective.